I've got a bunch of new cookbooks right now, just waiting to be explored. 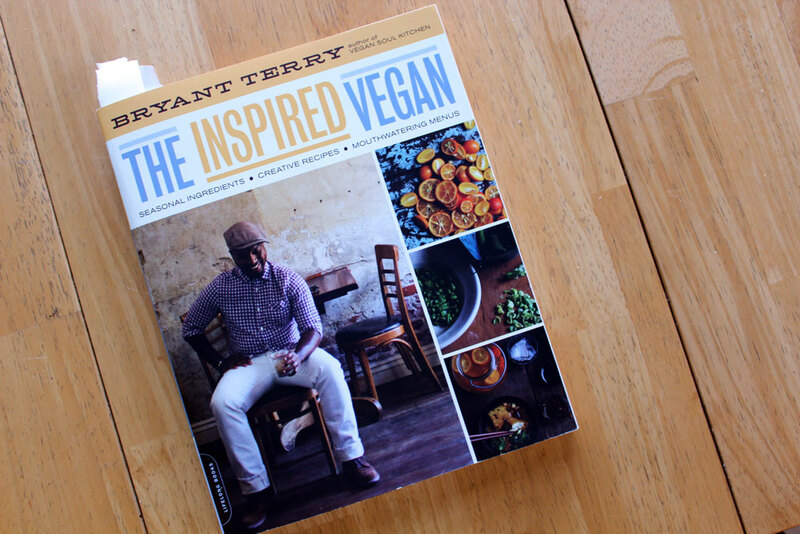 The other night I finally picked up my copy of Bryant Terry's newest book, "The Inspired Vegan," and started reading. Right away I was sucked in. You know how some cookbooks are just fun and interesting to read? This is definitely one of them. There is a wonderful little intro section with his thoughts on various staples or culinary tips - interspersed with delicious recipes for the basics - like infused oils, marinated beets, caramelized onions, tomato sauce, and so on. It's pretty great. Within minutes, I had started bookmarking recipes throughout the book - just look at all those little tabs sticking out! 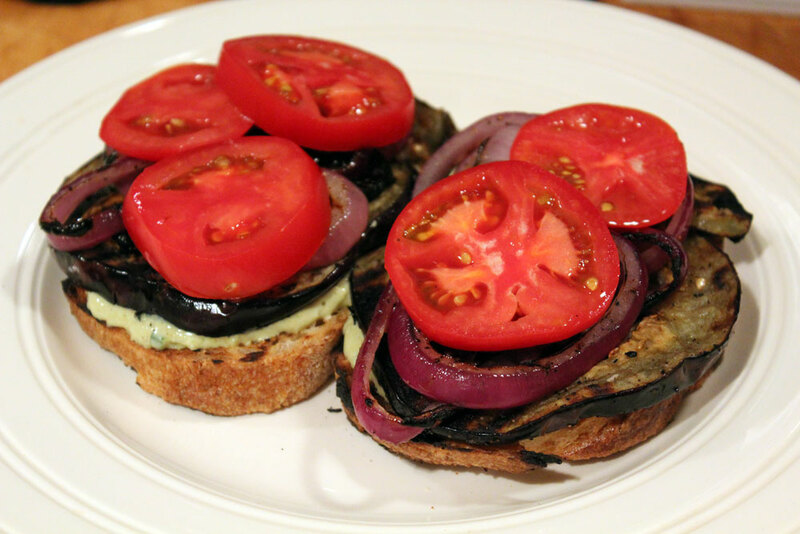 For last night's dinner though - I chose to make the Open-faced Grilled Eggplant, Red Onion, and Heirloom Tomato Sandwiches with Creamy Celeriac Sauce. That is an actual quote from Mr. Vegan Eats & Treats. After just one bite. Then, after a couple more bites, he said "This goes on the list of the best things you've ever made!" So true. These babies were good, good, good, good, good. Everything was perfect. I reduced the oil in the marinade and the celery sauce a bit, but that's the only change I made. The marinade had just a little cayenne, and the heat level was absolutely perfect - just enough to wake up the palette and turn up the volume on the other flavors. The flavors, the combos, the textures - truly, this was perfectly great. I cannot wait to make them again. 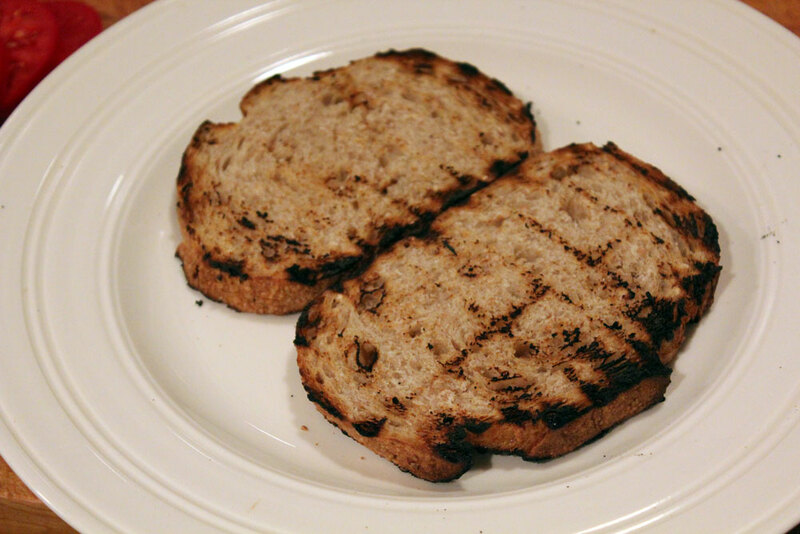 Even the bread slices were grilled, which was an excellent touch. 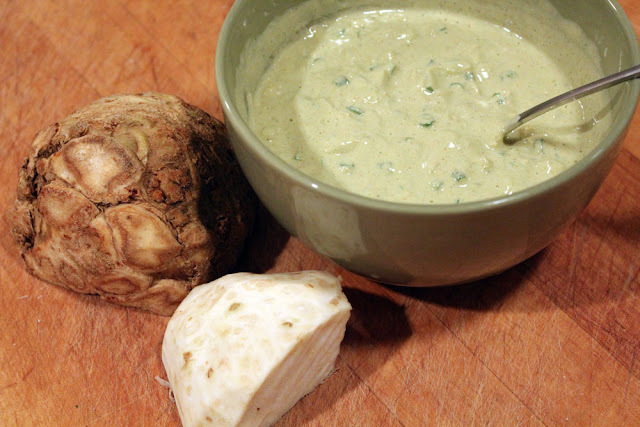 The amazing Creamy Celeriac Sauce definitely deserves a mention. It's so damn good. And beautiful. Creamy, and filled with unexpected ingredients and flavors that all align so nicely. It's such a joy to find a cookbook with recipes that I would truly never think of on my own. I mean, I can grill veggies and put them on bread as well as the next vegan, but with this sauce and the special marinade on the veggies, these sandwiches were truly elevated to the Next Level. I love this book so much, I want to eat it up! I cannot wait to cook more recipes from it. Stay tuned! Cutest picture/drawing of all time, Amey!!!!!!!! Funny, this is the only recipe I have yet to make from this cookbook and I too thought it was amazing. I want to eat that celeriac sauce on everything (and I'm not sure I'd ever had celeriac before this)! ha. I was just wondering when Bryant Terry was going to come out with a new book. I was just flipping through Vegan Soul Kitchen yesterday. Agree with the mister's Wow comment. and super cute pic...always!!! Great doodle. Me want recipe! 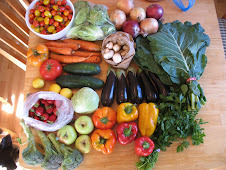 That looks amazing, I love sitting down to read a new cookbook & feeling inspired to try something new. I have so many little bookmarks like that sticking out of my cookbooks, I even have a little pencil case to keep the scraps of paper in! Those sammies look amazing! I second Mr. Vegan Eats & Treats' WOW! Have fun with your new book! Oh my gosh, this sounds sooooo good! I love that book to pieces. Now I know what I'm making next! I just checked that one out from the library last week, it is so fun to read. I get overwhelmed by his recipes cause I want to make the whole menu, make the playlist, watch the recommended movie etc. it's too much! Thanks for the inspiration of a good starting point! Gah! 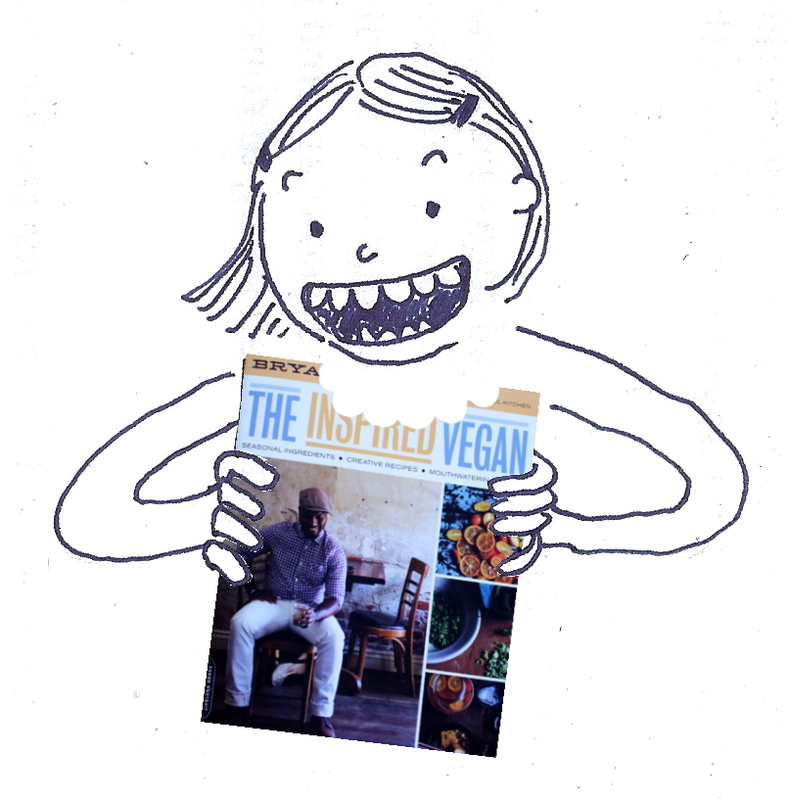 Nowadays there are so many vegan cookbooks that I haven't even heard of half of them! Celeriac is one of those weird alien veggies that I've never used. Gotta change that! Now I really want to check out this book, sounds super awesome. I really love that cookbook, it just makes you feel good! And I've always wanted to try that celeriac sauce, just because it would be really darn useful to have SOMETHING to do with celeriac other than soup. It is so cheap and plentiful here in Berlin. That drawing completely tickled me! I think I'm going to have to develop a filter that means I can't look at any more vegan cookbooks until I've cooked every recipe in the eight gazillion I've already got! I'm excited to see what else you make and what you think of the rest of the recipes. This one has been on my radar for a while, but I haven't yet bought it. I've been so disappointed by all of the cookbook "reviews" that I've read recently, because it seems like people never actually cook from it, just review it based on their impressions. I love that you actually made something to be able to truly review the recipe! Celeriac sauce sounds amazing! I love celeriac but kind of always forget it exists.